Expert discusses three promising options to treat patients with medullary thyroid cancer. Many types of growths and tumors can develop in the thyroid gland. A medullary tumor is rare and malignant, with medullary thyroid cancer (MTC) accounting for about 4 percent of all thyroid cancers. The inherited form, familial MTC, often develops during childhood or early adulthood, and it can spread early. For known families afflicted with multiple endocrine neoplasia type 2 (the subtype known as familial medullary carcinoma of the thyroid), due to inherited RET mutation, are screenings by checking serum calcitonin levels and immediate thyroidectomy, if abnormal. Cases of non-inherited disease, more common in older adults, are called sporadic MTC. In addition to inherited risk, factors contributing to the risk of developing thyroid cancer in general include the RET gene mutation, exposure to radiation or a low-iodine diet. Gender and age also play a role. Thyroid cancers occur about three times more often in women than in men. Women are often diagnosed in their 40s or 50s, men in their 60s or 70s. MTC is difficult to diagnose and treat. Often the first treatment is surgery, which frequently cures patients in stage 1 or 2. However, for cases in which initial treatment does not work and the cancer progresses, three potential drugs, Capresla (vandetanib), Cometriq (cabozantinib) and Afinitor (everolimus), are being further explored. 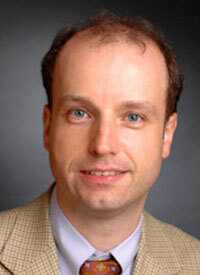 In an interview with CURE, Jochen H. Lorch, M.D., discussed the treatment landscape of MTC. He is director of the Thyroid Cancer Center, Dana-Farber Cancer Institute, and assistant professor of medicine at Harvard Medical School, both in Boston. Tell us a little bit about MTC and how it is treated. Lorch: Many times, MTC is stable and does not require treatment for many years. Eventually, though, most patients enter an accelerated phase at which time they do require systemic treatment. Currently, two drugs have been approved by the Food and Drug Administration (FDA), Capresla and Cometriq, both based on phase 3 data. These were randomized trials, similar in size. However, the entry criteria were quite different. For example, in the Capresla trial there was only the requirement of a certain calcitonin [a hormone made by the thyroid] level — greater than 500 — and no specific requirement for disease progression, while in the Cometriq study, progression was required within a little bit more than a year. Both trials showed a difference in progression- free survival (PFS), but no difference in overall survival, which is because there was crossover allowed. Only subset analysis in the Cometriq trial identified a subset of patients with a specific mutation in the RET proto-oncogene, the M918T mutation, which is typically associated with aggressive growth and poor prognosis. Those patients had a survival benefit, not just a difference of PFS, but also a survival benefit whenever treated early with the drug. You were involved with a phase 2 trial of Afinitor. Please tell us about the findings. We conducted a phase 2 study using Afinitor in thyroid cancer that was primarily geared toward differentiated thyroid cancers. However, we also included an exploratory cohort, which included 10 patients with MTC. What we found was that most of the patients responded quite well. We did require progression within six months, selecting for very aggressive cases only, and found that PFS was more than a year, which in this patient population is good. There has been a spike in positivity of trials for patients with MTC who have required systemic treatment. One of the reasons is that MTC is rare. The second reason is that many patients do not require systemic treatment, but can be managed with active surveillance alone. Also, the two FDAapproved drugs, Capresla and Cometriq, [were found to] generally work well for a long period of time. Finally, in our study, when we used Afinitor the data were quite striking, although it was just an exploratory analysis. To my knowledge, there is only one trial open right now for MTC, which is open at several centers in the Northeast including the Dana- Farber Cancer Institute. The trial is using Stivarga (regorafenib) in patients who have failed one of the two drugs that are FDA-approved. In the next five to 10 years, what do you think the treatment of MTC will look like? Without bigger clinical trials, it is somewhat hard to say where it is going. I think in this day and age, you can’t talk about cancer without talking about immunotherapy, and there is no doubt that some trials will be opening sooner or later. The other group of trials that will be coming are [of] RET inhibitors. These are tyrosine kinase inhibitors that are, in many ways, similar to Capresla and Cometriq, but they are more specific in blocking the RET part of the oncogene. The RET part of the oncogene is what drives MTC in the vast majority of cases. So, the hope is that this will add another line of treatment. None of the FDA-approved treatments are curative in any way, so the best you can expect from them is to seize control hopefully for an extended period of time, not a cure. Eventually, these patients all progress and need more treatment. It will be good to have another line of treatment available for them. The other hope is that perhaps the RET inhibitors might be a little bit more favorable in terms of toxicity. Currently, Capresla and Cometriq have rather significant toxicities, and frequent dose reductions occur in the majority of cases in which we use them. The hope is that some of these newer drugs will be better tolerated because they may be more specific to the actual target that is driving the cancer. How do you navigate which drug to use first in a patient? There really is no clear guidance. The big question of when to start is based on whether they have disease progression and how quickly, and ultimately calcitonin levels. Scans are what count. If targeted therapy and/or immunotherapy are introduced for the treatment of MTC, how do you think they would change the treatment of patients as individuals? The problem with any currently available treatments is that we have a very poor understanding of what the actual target is, even in the relatively simple case of targeting RET or tyrosine kinases. The potential sequencing of concurrent treatments that should be used will be the work of the next decades. At this point, in MTC, there is absolutely no data that are published, so we are only at the very beginning of this road and we will have to see what we find.